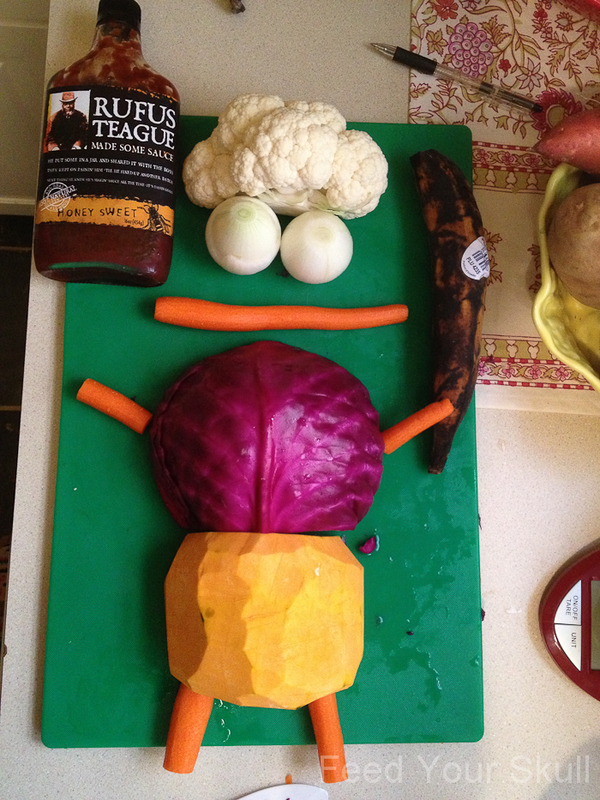 See how the Mr. Magoo of veggies is carrying that plantain like a torch? 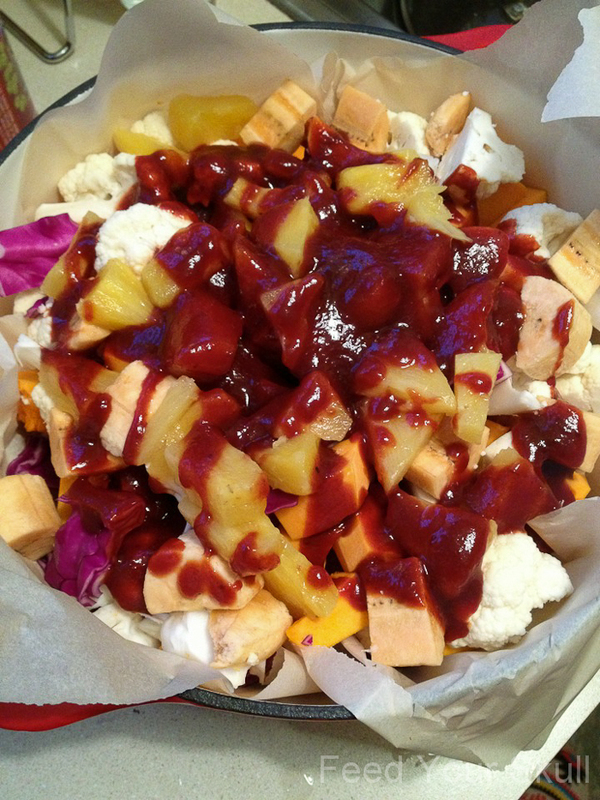 It’s because he’s awesome and about to become the most amazing dinner ever and he knows it, a Hawaiian BBQ veggie bowl. Last night’s dinner was inspired because I wanted to use up the BBQ sauce we had in the fridge. We were on our way to the store to return our Redbox movies (Airborne and Cabin in the Woods) and I was daydreaming about what to do with that sauce. Decided that a squash would be tasty and filling so we could pick up one of those. We already had the carrots, cabbage, and onions. It started to come together that something like a BBQ pizza – you know the one that comes with pineapple and chicken – sounded really good. We had a fresh pineapple as well as some in the freezer so we were set there. A vegetable medley topped with BBQ sounds amazing, right? The cold leftovers are great too. While in the store, when you don’t have an exact plan of what you’re going to do I highly recommend you stand and stare blankly down a produce aisle. Out of the way of others of course. Continue to stare blankly and half meditate daydream over the vegetables you see. I did that last night and my eyes touched down on plantains!!! Yes plantains! I don’t think I’ve had a plantain in years and that is much too long. Imagine going without kale for years. Yeah, I didn’t think so. Plantains are very similar looking to a banana and can be cooked when they are fully ripened and a little bit sweeter or when their skin is green (unripe) in more savory dishes. I like to pick a ripe plantain that is almost or mostly completely black and has a little give to it when you press between your fingers. This plantain will kind of feel the way a ripe avocado or mango feel not like how a very ripe banana would feel (that might make a mess everywhere). When you peel it you might be surprised that it peels more like an unripe banana vs ripe. These fruits have a brilliant sweetness that I have to say reminds me of banana baby food, but they are firm and even after baking have the firmness of a roasted carrot but texture of a banana. Enigma? Yes. I roasted this dish in the oven and used the veggies we had on hand with the exception of squash and plantain. Plantain, pineapple and BBQ – well that just sounded like heaven. A quick note, I roasted these in a cast iron Lodge pot, which I didn’t preheat so it took over an hour before the squash was just right. I think if you used a cookie sheet or glass cake pan, cooking time could be around 30 minutes or perhaps less than an hour if you preheat the cast iron. 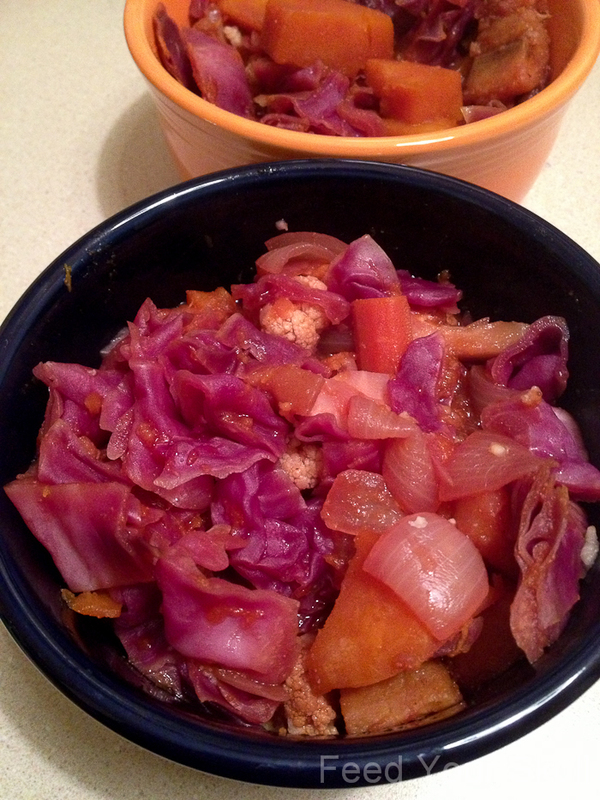 I lined the pot with parchment paper again and loaded the veggies and fruit in before topping with BBQ sauce. 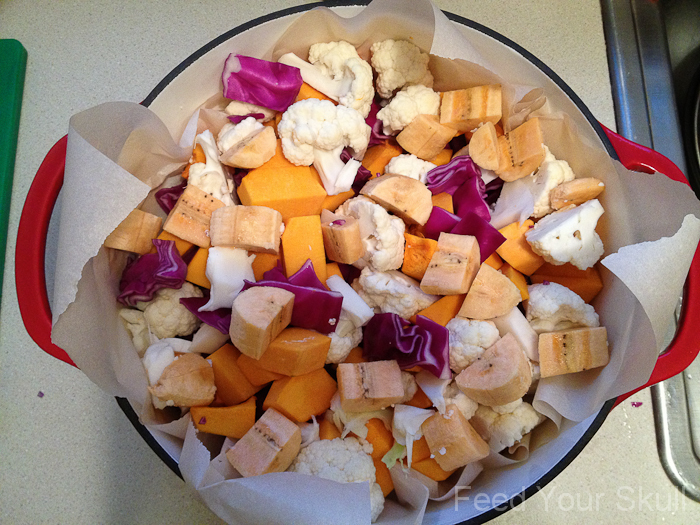 Bake until veggies are to your liking and enjoy! Toss ingredients into a cast iron dutch oven (6qt) lined with parchment paper. Cover and bake for about an hour or until veggies are cooked to your liking. Feel free to salt or season with garlic powder or fresh minced garlic as we did. This was delicious! I know you will enjoy it!